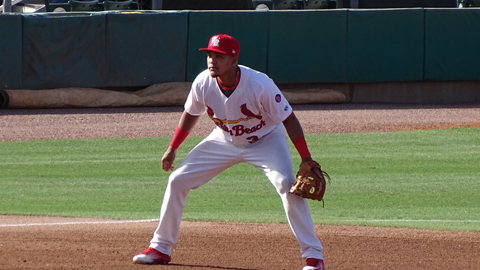 Jupiter, FL – The Palm Beach Cardinals (60-48, 20-21) grabbed three hits each from Luke Dykstra and Leobaldo Pina to grab a 6-5 win over the Clearwater Threshers (60-52, 22-20). Mike O’Reilly started for the fourth time this season and improved his record to 2-0. He tossed 6.0 innings of eight hit ball, giving up four runs. He also walked one batter and struck out five. Clearwater jumped on the board early in the first as Zach Green hit a two-run moon shot to give the Threshers a 2-0 lead. Palm Beach cut the lead down to one in the bottom of the second. Leobaldo Pina hit a one out single and got to second on an Andy Young ground out. Luke Dykstra come to the plate and launched a single to left allowing Pina to score and make it 2-1. O’Reilly gave up another home run in the top of the third inning, this time to Mark Laird to make it a 3-1 game. Palm Beach jumped back on Clearwater’s starter, Sixto Sanchez, in the bottom of the fourth. Pina got things going with a single to start the inning. Young advanced Pina to second on a single of his own. Dykstra grounded out, but got both runners to move up. Jeremy Martinez hit a single to drive in Pina and move Young to third with one away. Jose Martinez took a fastball to centerfield for a sacrifice fly to drive in Young and tie the game at three. The Cardinals later took the lead in the bottom of the sixth. Pina led off the frame with a double and got to third on a sacrifice bunt from Young. Dykstra took advantage and hit a single to right-center to put Pina across the plate. Jeremy Martinez singled putting runners at second and third. Jose Martinez followed with a single to centerfield to score Dykstra and give the Cardinals the 5-3 lead. Clearwater started the seventh with back-to-back doubles from Edgar Cabral and Emmanuel Marrero to pull back to within one at 5-4. Bilardello turned to Brady Bowen who got two quick outs from the left handed hitter and turned it over to Dailyn Martinez who got the last out of the seventh on one pitch to keep the one run lead. Thomas Spitz made it a two run game once again with a home run to left and to give the Cardinals a 6-4 lead. Martinez came back out to pitch the ninth and gave up a double to Cabral to start the frame. He struck out Marrero and turned the ball over to Ian McKinney. Laird laid down a bunt and reached first base to put Threshers at the corners with only one out. McKinney struck out Cornelius Randolph looking for the second out. McKinney gave up a double to Green to make it a one run game once again with runners at second and third. McKinney got Wilson Garcia to ground out to Pina to end the game. Has the no-hitter lost its luster?